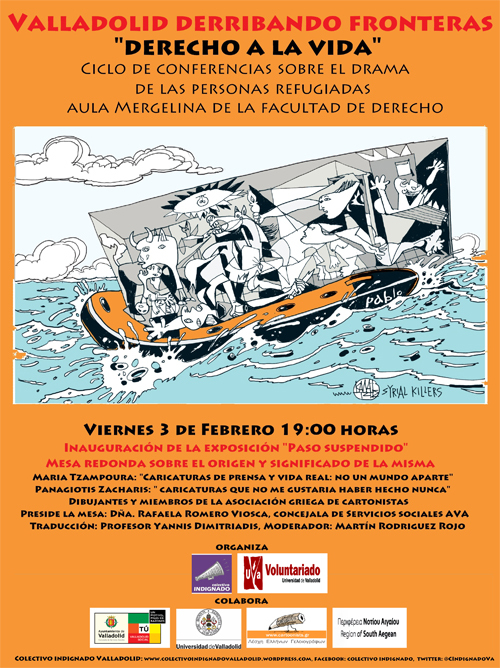 Exhibition “Suspended Step- Cartoons on the refugee crisis” goes to Spain! Cartoonists may not be able to change the world’s unjust order but we can translate into images the reality we witness around us daily, just as we’ve been set out to do in the case of the refugees’ drama. The exhibition is not meant to be in one place only. It started at Rhodes island last March and after a few “stops” to the islands of the region of South Aegean, it ended up to Athens in May 2016. The exhibition will be hosted at the Valladolid University(Spain) from February 3rd till March 3rd 2017 on the occasion of the “DERRIBANDO FRONTERAS”. Opening will be at Febryary 3rd, 19:00 and cartoonists Tzaboura Maria and Zacharis Panos will be main speakers on behalf of the Greek Cartoonists Association, at the .